Necromancy? Perhaps not. 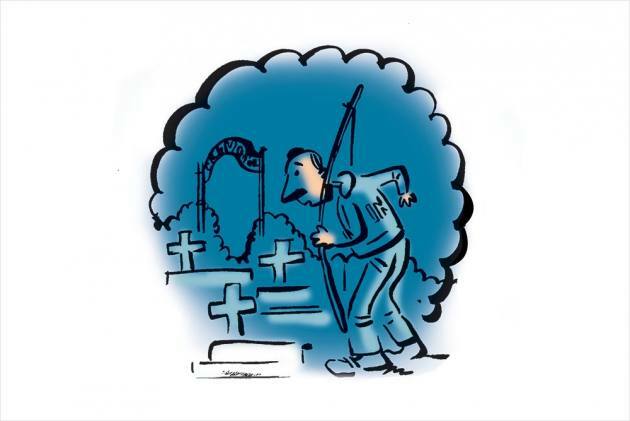 But members of India’s arch­ery squad are seeking help from beyond the grave through a training regimen that requires them to visit crematoria in the dead of night and commune with imagined ghosts, or retrieve some object left there. This seems unorthodox, but it’s a tried and tested method to improve archers’ mental conditioning—heartbeats are controlled and nerves calmed (another exercise pre­­­s­­­­cribed by the Indian coach includes jumping into a pool from a height of 10 metres). The South Koreans, paragons of the sport with 15 Olympic gold to their credit, have been doing these since the late 1980s. Their repertoire also inc­­ludes handling snakes, cleaning sewage and going into ‘haunted’ houses where they are waylaid by actors dressed as ghosts. For distressed mountaineers in the Himalayas, a rescue helicop­ter may be the most welcome of sights. But what if a helicopter arrives to perform a ‘rescue’ at the first sign of inconvenience—such as your guide noticing that you have a slight cold—and you and several others are cajoled inside? Multiple insurance firms get the bill for the single chopper; interested parties—trekking operators, lodge owners, helicopter companies, hospitals—benefit from the payouts, and the insurers are the ones left in dire need of rescue. The racket is a ser­ious issue in Nepal, with an alliance of international insurers banding together to warn the government that they will stop providing cover unless action is taken by September 1. The government launched a probe in June, but insiders are sceptical, with some calling it a “PR exercise”. “Have you not seen Baywatch? You have to be modern. You don’t have to be old century. You have to adopt modern means,” said Justice Shantanu Kemkar of the Bombay High Court while instructing the Brihanmumbai Municipal Corporation (BMC) to ensure that Mumbai’s beaches were safe. Justice Kemkar, together with Justice Sarang Kotwal, was hearing a PIL about the condition of Maharashtra’s beaches. His remark was in response to the BMC’s advocate saying that every Mum­bai beach had a lifeguard with a stationary vehicle. “How do you keep continuous watch,” asked the judge, pointing out the need for vehicles to keep patrolling the beach. The jud­­ges also directed the BMC construct watchtowers—a 2006 court order that’s yet to be imp­lemented. Will lifeguards also be required to run in slow motion, one wonders. Virupaksha temple, with a storied past stretching back to the seventh century, remained undis­turbed as imperial Vijayanagara crumbled around it. Its priests still preside over arcane and fantastic rituals there amid the ruins of Hampi, and Peter G. Deverell, a visitor from Britain, was fortunate enough to get a glimpse of one of these ceremonies in November last year. It involved a man and a woman attired in elaborate costumes, and Deverell didn’t miss the chance to snap a few photographs. It took him some time to rea­lise that what he was witnessing was in fact a wedding ceremony. Abashed, he crept away silently, and has now sent over some cheques to make up for any hurt feelings: £251 for the newlyweds, £51 for the priest and £11 for the temple. That pesky extra ‘one’ strikes again—how very auspicious! The Sharada script is to be resuscitated after a near-death experience. Dating to the late first millennium, it was once the primary writing system for Kashmiri, but its popularity dwindled over the centuries and it only survived among a few members of the Pandit community—and the last of these scholars have now died. But two years ago, a group of 14 displaced Pandit linguists, the Core Sharda Group, began to teach the script to 500 youngsters (after spending years mas­te­ring it themselves). As the students live across India, the 40-day course takes place via WhatsApp, with the students being assigned two letters to learn each day. An undercover agent infiltrates a drug cartel and has a showdown with its kingpin. The hero is played by Bhutanese body­builder Sangay Tsheltrim. And the villain? India’s own Thakur Anup Singh, who played the antagon­IST in Commando 2 (2017). The Bhu­­tia language thriller Singye (Lion), due to be released in Bhutan in October (and later in Assam), is the first feature film to be made as a collaborative effort between Indian and Bhu­tanese production houses. Co-producer Biplab Doley said the project was “a great effort for better socio-cultural ties between the two countries”. Former Sri Lankan president, Mahinda Rajapaksa, seems disinclined to let go of power. Despite having served the constitutional limit of two terms, the 72-year-old wants to stand for election yet again. He had amended the constitution in 2010 to allow himself to stand for a third term in the 2015 election, but the limit was reintroduced through the 19th Amendment after he lost that election to Mai­thripala Sirisena. The argument goes that this limit was introduced when Rajapaksa was no longer president, and could be int­erpreted as only taking into account terms served after that point. Rajapa­ksa’s party, the Sri Lanka Podujana Peramuna, plans to seek a clarification from the supreme court. Pakistan’s propensity to not honour deals signed by previous governments is raising serious questions about its credibility as a safe investment destination. New governments putting agreements signed by predecessors to scrutiny is not totally unheard of. Such inst­ances, however, are few and far between in a democratic set-up and regarded as exceptions rather than the rule. But in Pakistan this has almost become the norm. Some deals, like the one for Reko Diq copper and gold mining project, were struck down during the tenure of Pervez Musharraf’s government and some during the rule of Pakistan People’s Party (PPP)-led government. Critics of the PML(N) said the two deals, with Qatar and China, had avoided the open bidding process so as to pay a higher price for the projects. According to The Express Tribune, the agreements were revoked on the grounds of alleged involvement of omission and commission as well as kickbacks. These cases were also taken up by the National Accountability Bureau (NAB) and the apex court. This led many disgruntled investors to move international courts to seek damages, with Pakistan losing several cases. The Pakistan Tehreek-e-Insaf (PTI) government is now trying to find a way out as to how it can avoid paying the millions of dollars as dama­ges to these investors. Interestingly, this has not prevented the new petroleum minister Ghulam Sarwar Khan to announce that his government would examine all contracts awarded by the previous PML(N) government, including a 15-year liquefied national gas (LNG) supply deal with Qatar. The PML(N) government had signed two major multi-billion dollar projects, one with Qatar and the other with Beijing on the China-Pakistan-Economic Corridor. Both these deals were signed under a government-to-government arrangement by avoiding the open bidding process. This led many critics of the PML(N) to allege that it was completed to pay a much higher price for the two projects. Sarwar Khan indicated that these projects could be taken to the NAB after their examination by the ministry. But if misdeeds of “omission and commission” are found in these two projects, will they be scrapped? That seems to be a question in the minds of political observers. That is bec­ause if they are declared void, Pakistan may face more cases for damages at international courts. Does this mean the new PTI government will restart negotiations with China and Qatar? For many, this delicate matter will be a test for PM Imran Khan. Could he avoid touching these two sensitive projects astutely, so as not to displease Pakistan’s old allies?